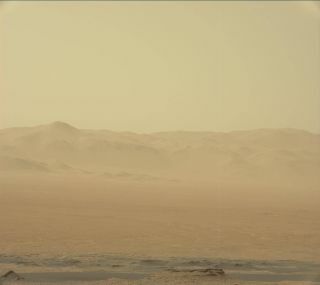 Dust hangs in the Martian air in this photo taken by NASA's Curiosity rover on June 2, 2018. NASA's Curiosity rover is keeping tabs on the huge Martian dust storm that has sidelined its older cousin on the other side of the planet. That storm, which covered as much area as North America and Russia combined as of today (June 12), has engulfed the golf-cart-size Opportunity rover, plunging its environs into perpetual darkness. The solar-powered Opportunity has therefore temporarily ceased science operations. This is not the first major dust storm weathered by Opportunity, which landed on the Red Planet in January 2004: An even larger storm forced the rover to stand down for two weeks in 2007. But the dust surrounding Opportunity now is much thicker than it was during that previous storm, mission team members have said. Opportunity beamed a message to its handlers on Sunday (June 10), which is a good sign; it shows the rover still has a decent amount of battery power left. Mission team members have a delicate balancing act ahead if the dust storm persists; they'll need to run Opportunity's heaters enough to keep the rover from freezing, but not so much that they run out its batteries. And Martian cold can kill. Opportunity's twin, Spirit, which also touched down on the Red Planet in January 2004, apparently froze to death after getting stuck in thick sand in 2010. Curiosity has been exploring Gale Crater since August 2012. The car-size rover started its Mars mission on the crater floor, but it's currently climbing through the foothills of Mount Sharp, which rises 3.4 miles (5.5 km) into the Martian sky from Gale's center.